Pets may occasionally have accidents and soil your clothes or bedding with urine. Cats are not only particularly prone to this, but their urine has an odor that is very hard to remove, especially if it is dried and set-in. More than one homeowner has had a feline who chooses to use a basket of laundry as a substitute for a litter box, and loose clothes lying around a bedroom can also be a target. You can, however, remove cat urine and its odors from any washable fabrics. The same method can be used for other types of urine. After dealing with the immediate problem, also consider behavioral or health issues that might be causing your cat to soil laundry in this way. 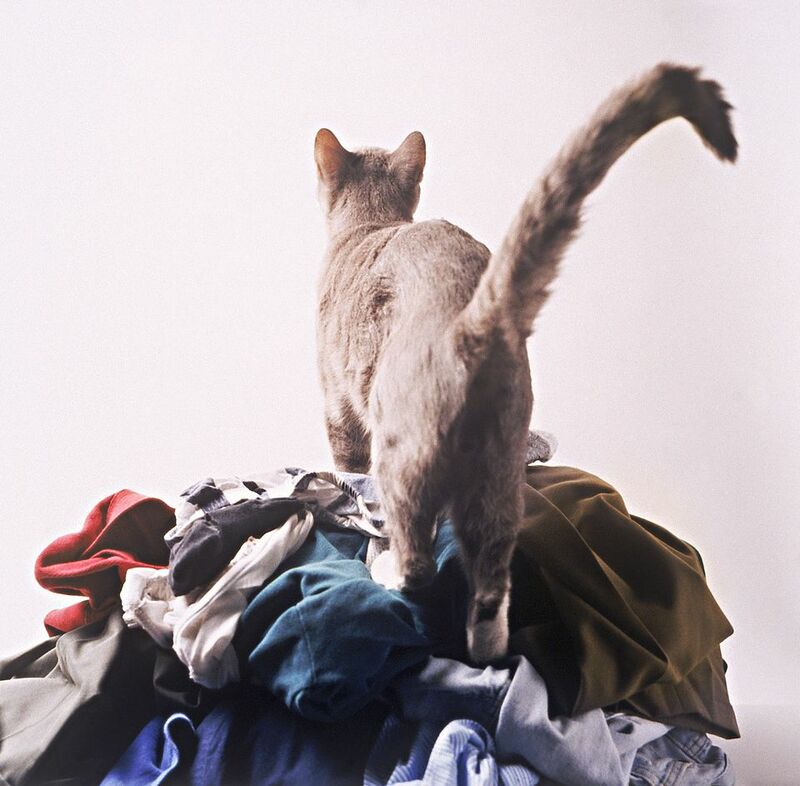 Throwing urine-stained clothing or fabrics directly into the washing machine isn't a good idea since cat urine has a way of setting in its odors. If added to a general laundry load, you might even find that the urine-stained items contaminate an entire load of laundry with its scent. It's best to pretreat the urine first before moving to the next step. Rinse out the spot with clean, cool water. Blot the stained area dry with paper towels. Do not scrub at the stain, since this can drive it deeper into the fabric. Your goal here is to remove as much of the urine as possible before moving to the cleaning stages. Fill a sink with water and add a half-cup of oxygen bleach, such as Oxyclean. Do not use traditional chlorine bleach, as this can damage clothing. Mix the oxygen bleach thoroughly into the water, then soak the urine-stained items in the water for one to four hours. Caution: A variety of odor-removing products are available as part of the pretreatment, but never use a product containing ammonia to clean urine stains. Cats are likely to mistake the ammonia scent for urine and may then repeatedly urinate in the same place. For best results, use a two-part cleaning process to remove urine stains and odor. The first part of this process is a vinegar wash. Mix one cup white vinegar to three cups water (1:3). Coat the urine-stained item with this solution and allow to sit for a few minutes. Cover the stained area with baking soda, if you wish. Baking soda will work along with the vinegar to absorb and neutralize odor. Wash the urine stained items in a washing machine set on cold or lukewarm water. Do not add laundry detergent for this washing. Do not use warm or hot water, as this can set in the stain and odor. Air-dry the urine-stained items. This can take a full 24 hours if you are drying indoors. Do not use a clothes dryer, because any heat can serve to set in the odor permanently. By now, a good deal of the stain and odor has been removed, and you can move to traditional washing. Wash the urine-stained items in cool water, using an enzyme-based detergent. Enzyme-based detergents are known to work on organic-based stains. The enzymes effectively "eat" an organic material, including cat urine. Detergent labels will indicate if they contain enzymes—most cold-water detergents are of this type. Air-dry the items once again. Once they are fully dry, smell the items carefully for any lingering odors. If the urine was fully dried in, it's possible you may need to repeat the final laundering step. To avoid future incidents, it's important that you address the problem with your cat. When cats urinate in places other than the litter box, it very often indicates a health or behavioral issue. Begin by taking your cat to the vet. Aside from a dirty litter box, a urinary tract problem is the most common reason for litter box avoidance. It's essential that you rule out a health problem first. If your vet rules out a medical cause, then you will need to address the behavioral reasons for your cat's inappropriate urination. If your laundry has come out smelling fresh, but you still detect the lingering odor of cat urine in your home, you'll need to perform some detective work. It's possible the pet has marked floors, furniture, or other areas in your home. Arm yourself with a blacklight. Most blacklights work better in complete darkness, so work cautiously. Use the light to scan walls, floors, baseboards, furniture, and any other surfaces. Hold the light close to the surface for best results—urine stains will glow fluorescent white. Use chalk or sticky note paper to mark the areas where the blacklight reveals stains. Once you've identified the soiled areas, use an odor-removal product to clean the area. After thoroughly cleaning, you can enjoy a freshly-scented home once more.